European equities are set to open lower tracking overnight declines in the US. There was no real news catalyst for the sell off and the market action was orderly, steady and sustained. Not the kind of flash in the pan, knee-jerk reaction you see to a headline or economic data release, but more symptomatic of the big money deciding that this point in the market cycle is a good place to liquidate. The question on traders' minds at the moment is how much more downside do we have to come? European equities are set to show modest gains on the open due to some dovish FOMC Meeting minutes overnight. The minutes confirmed that Janet Yellen's 'six months' comment about the first rate hike was a slip of the tongue. Although we will see a bit of a pop higher, this merely means that market expectations and the Fed's efforts at forward guidance are back in line, so nothing really new to rally on. Technology shares led the rally in the US stocks in early trading yesterday, with Alcoa also seeing a sharp 3.8% increase in share price. Therefore, with easing concerns regarding the timing of the interest rate hikes, the Dow Jones closed 193 points higher at 16,441. Traders are continuing to tread cautiously this morning, with stock markets in Europe set to open fairly mixed. Yesterday's minor losses belie the apprehension that seems to have descended on markets at the moment. Negative cues seem to be popping up out of nowhere, particularly with the US tech sell off and the Ukraine situation flaring up again. As a result, investors are highly conscious that if we get a few more negative news stories, we could easily see the balance tipped in favour of a more sustained sell off. There's usually a bit of trepidation in the session before the FOMC minutes are released, but considering the amount of flip-flopping from Janet Yellen after the meeting, anything of influence will probably be shrugged off. Instead, today's unease is likely to come from traders scanning the horizon for potential black swans. We saw a rather volatile session for US stocks yesterday, ahead of the start of the reporting season. 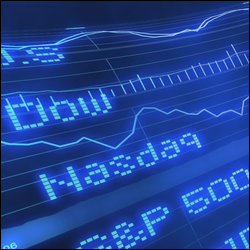 After an initial sell off, technology shares lifted their spirits and pushed for a rebound in the afternoon, but this was not enough to prevent the Dow Jones closing 17 points lower at 16,246. The start of the corporate results season was driven by aluminium producer Alcoa, which surpassed estimates in the first quarter. European equities are set to start flat as traders tread cautiously. Whilst the mini-wreck of US technology stocks has weighed on global markets, European sensibilities hadn't allowed valuations to reach such unfathomable levels. Therefore, it's understandable that European investors don't see why there should be a wider sell off over US specific over-optimism. However, closer to home, events in the Ukraine will be adding to traders' hesitation. The Donetsk region may now jump on the referendum bandwagon and pro-Russian supporters have taken hold of buildings in Luhansk and Kharkiv. Following the annexation of Crimea, it's not too much of a stretch in imagination to assume that Russia will gladly welcome all the other regions into the Federation. Pfizer and American Express led the slide in the Dow Jones yesterday, with the trading session ending 161 points in the red at 16,261. The start of the earnings season kicks off today and we could see a rebound for the US equities but the short-term trend has turned bearish after two days of hefty losses. European equities are set to slump on the open following the sell off into the US close on Friday. Despite a positive end to European trade, all that hard work by the bulls is about to be undone and markets are set to open almost exactly where they opened on Friday morning. Indices have had a very respectable bounce since mid-March but momentum is waning as the lukewarm outlook just isn't convincing enough for traders to really take things higher. The Non-Farm Payrolls data indicated that the unemployment rate held at 6.7% amid a gain of 192,000 jobs last month versus estimates for a rise of 199,000 jobs. US equities moved up as an immediate reaction, only to plunge for the rest of the afternoon, ending 151 points lower. The numbers were slightly less than expected but probably enough to keep the plans of 6 more months of QE tapering on track.